Using a track mounting system is a clean, clever, and innovative way to mount multiple devices in virtually any application. The RAM® Tough-Track™ takes this innovation to the next level by offering a center access point for your track components and multiple track lengths to accommodate your desired mounting surface. Whether you’re mounting to an ATV, powerboat, or truck, the RAM® Tough-Track™ will add immense value to your vehicle or workstation. The modular aluminum version of the RAM® Tough-Track™ can be drilled to any flat surface and is designed for use with #8 screws for easy installation – hardware not included. Engineered to be a dependable and rugged mounting solution, the anodized aluminum provides a smooth slide across the track and anti-corrosion protection. With the use of a center or 90-degree top-loading extension, configure your track system to virtually any desired length and placement. The top-loading composite version of the RAM® Tough-Track™ features mounting holes adjacent to the track, offering reinforced security for stable mounting. Compatible with a wide variety of RAM® track bases, this track mounting solution can easily be drilled to any flat surface. Available in three different lengths and two different widths, this version of the RAM® Tough-Track™ is ideal for creating a track mounting surface via tubes, bars, and rails. The varying track sizes can accommodate rails from .625” to 2.625” in diameter and are compatible with a wide range of RAM® track mounts and components. Available in lengths ranging from 4" to 30", the RAM® Hand-Track™ is an ideal track and handrail solution for ATVs, boats, kayaks and more. 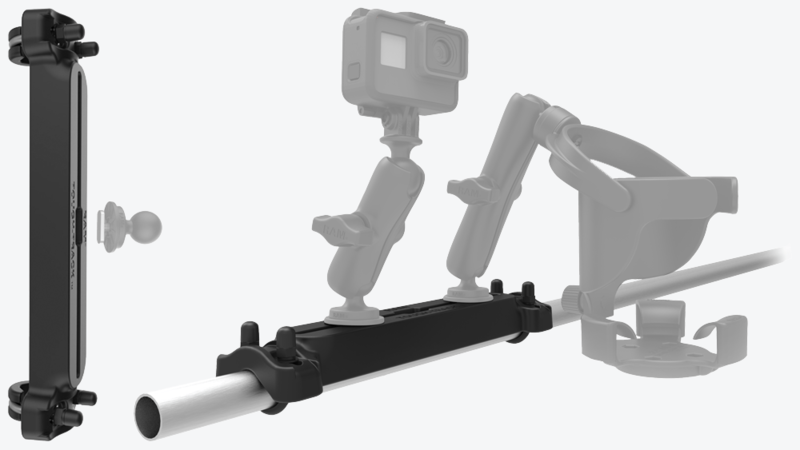 Compatible with all RAM track mounts, the Hand-Track includes two top-loading end caps for attaching to a flat surface. To combine multiple tracks, pair with any top-loading Hand-Track Extension with Center Connector. For the most cost effective track mounting solution, check out the end-loading composite version of the RAM® Tough-Track™. Tapered ends do away with the use of end caps and allow for stress-free insertion and removal of track bases. The hardware fits in a sunken channel so the T-Bolt on the underside of track bases won’t be obstructed when sliding across the track. 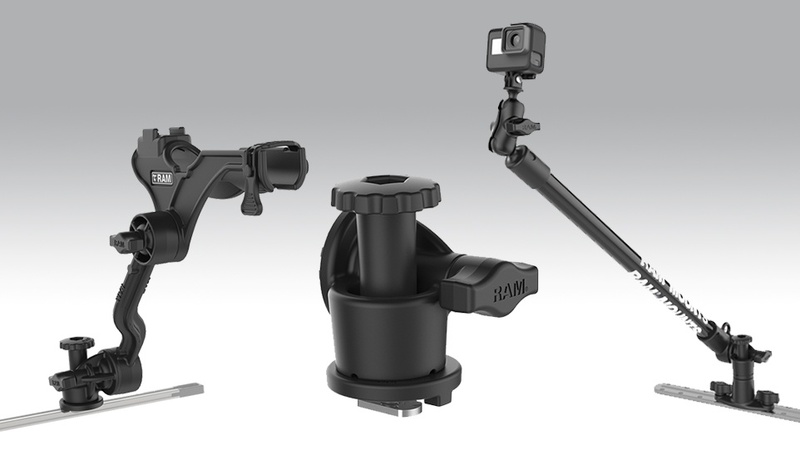 The track mounts and accessories below are compatible with virtually any track system on the market, including all versions of the RAM® Tough-Track™. 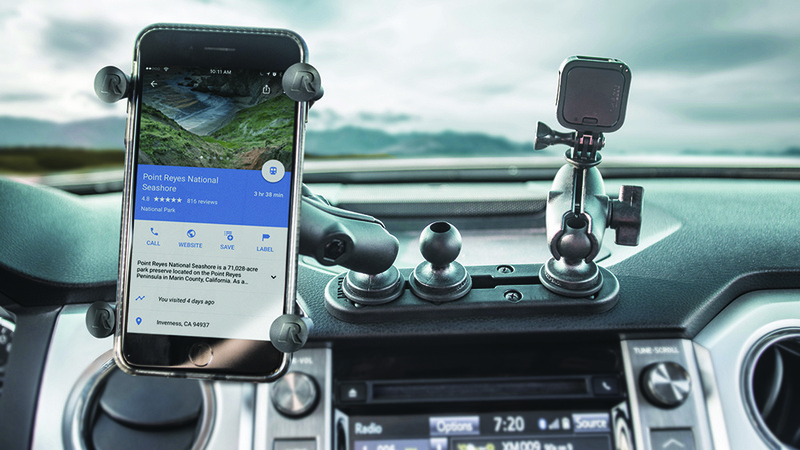 Whether you’re adding a full kit or individual components, RAM® offers a wide variety of solutions for connecting nearly any device.